Dried coriander seeds are most traditionally used in cooking. Coriander seed is a spice in garam masala and Indian curries which often employ the ground fruits in generous amounts together with cumin, acting as a thickener in a mixture called dhana jeera. Roasted coriander seeds, called dhana dal, are eaten as a snack. They are the main ingredient of the two south Indian dishes: sambhar and rasam. Coriander is native to South-Eastern Europe and grown extensively all over in India, Europe, Middle East, China. Coriander, commonly known as Dhania in India. It is a soft plant growing to 50 cm (20 in) tall. The mature plant bears small light pink color flowers that subsequently turn into globular or oval-shaped fruits (seeds). The dry fruits are known as coriander seeds. The word "coriander" in food preparation may refer solely to these seeds (as a spice), rather than to the plant. All parts of the plant are edible, but the fresh leaves and the dried seeds are the parts most traditionally used in cooking. Coriander seeds are an excellent source of minerals like iron, copper, calcium, potassium, manganese, zinc and magnesium. Coriander is an integral part of Indian cuisine. We regularly use coriander seeds as a spice, and coriander leaves for garnishing curries, salads, or soups. 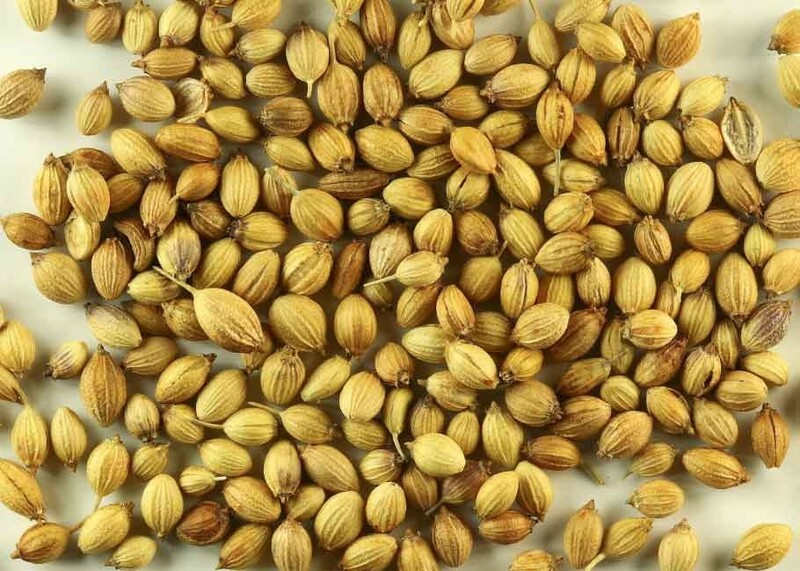 Buy Coriander seeds online at best price from KiranaPlace. Coriander seeds helps to control blood sugar, cholesterol and free radical production. Coriander seeds are quite effective in curing various skin diseases like eczema, itchy skin, rashes, and inflammation. As in other spices, coriander seeds also rich in dietary fiber. Coriander seeds prevent hair fall and help stimulate the roots for the growth of new hair(Add some powdered coriander seeds in your hair oil and use it to massage your scalp at least twice a week). If you are suffering from diabetes and cholesterol issues, you should drink coriander water daily. Coriander seeds are rich source of calcium, helps in bone health. Coriander is one of the best remedies for conjunctivitis (pink eye), also prevents other eye diseases and problems.